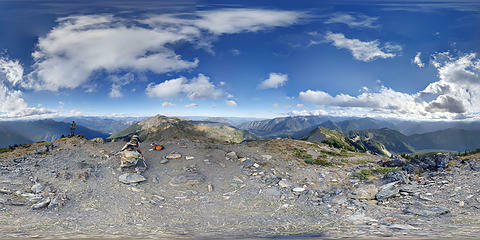 I've been taking 360 panoramas for a long time now. Finally image hosters are getting their acts together about sharing them. Is there a good way yet to embed them into NWHikers? I've seen one or two reports where someone has added them to Google Maps and embedded that. I haven't had much luck getting Google to accept the photos though. Now Flickr can display them, and allows sharing, but I can't seem to get more than the thumbnail to show up here. For security reasons we can't allow users to embed scripts, but I've enabled it for that particular flickr embed sequence. FWIW, the flickr script seems buggy. On my screen it doesn't rotate automatically like it does on flickr. And the arrow buttons don't work properly either. So if I embed other images with that same script would it work, or is it only for this particular photo? It should work for any flickr image. For grins I decided to compare google's viewer with flickr. I prefer google's viewer as you can embed higher resolution images and it has a fullscreen option. That said I'm not sure google's viewer works on IOS (due to viewer and image hosted on different domains). Thanks! I also prefer Google's but I can't seem to reliably upload photos. Hopefully flickr gets their act together, but at least there are ways to share these now. I've been taking them for years but until recently the best way to view them was through Google+ and even that wasn't great. I love photospheres, but also wish there was a better way to share them. I'm sure changes are coming, but right now this is how I do mine. I upload them to Google Maps via the Google Street View app on my phone. From there I use this link to locate the photosphere I just uploaded. Once you've found your photosphere on the map, move the view around until you find the main view you want it to start with, then copy the code on the right and paste the code where ever you are posting it. I hate having to upload everything to Google Maps, but it seems to be the best way to do it right now. The other advantage of this viewer is that users can zoom in and out using the mouse wheel. I'm sure it's just a matter of time before there is a better option so if someone finds one post it here!